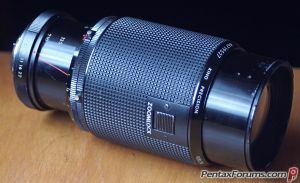 This Kiron zoom appeared when Vivitar moved to Tokina for its version 2 series 1 70-210mm zoom end 1970's. But this deserves "cult classic" cachet, and is a more than worthy alternative to those Vivitar Series 1 70-210mm TP's. The zoomlock is a distinctive feature, a sliding button locks the to/fro motion of the zoom sleeve. Some models also have a focus lock mechanism ( "adjustable focus limiters" ) as well (pics). Of note is that this is one of the few zoom lenses around, vintage or modern, that doesn't have a rotating front element - good for filter use. Can be found in M42, PK and PKA mounts, as well as other camera mounts of the era. Scan of original user manual (pdf) here. Aperture f4 - f22 with half clicks. UPDATE 8/17. I did a comparison between the VS1 70-210mm lenses and the tamron adaptall SP 70-210mm lenses and included this lens. Overall I can say the kiron was one of the most consistent performers - best or near best on every test pic. Add in that it can still be acquired for a negligible price and I have upprated to a classic MF maximum. I have now been able to gain an impression of this lens in comparison with my Tamron 19AH, and the VS1 (komine) I had for a while. The Vivitar S1 wins on handling, a nicely compact lens. The zoomlock is TBH front heavy, particularly if you have the focus limiter version. The Tamron wins on contrast, particularly wide open vs wide open. Is this lens as sharp as the other two? Not a lot in it IMO, though I can say for me this has consistent performance, better than average wide open (read 8.5/10). No, where this lens scores for me is colours. if you want some really blue skies, and colours with a bit of pop, between these meritworthy tp's this is the lens. These sample pics offer a bit of an example, the lower pic is taken with actually the tamron adaptall 70-210mm 46A, both on my lumix G1. jpg, lighting/shadows tweaked, crop and resize in faststone. A superb lens. Very sharp throughout the entire range with superb colour, which has a certain "pop" to it. Aberrations are well controlled. Bokeh is smooth and creamy. This lens is my favourite at the moment. Athough is it a heavy lens, it handles beautifully. The focus mechanism has a nice feel and action, making good focus easy. The Kiron 70 - 210 is a real sleeper and compared very favourably (dare I say as good as) my Series 1 Vivitar. Highly recommended. Another superb Kiron design. Sharp and light. Very well built. Pros: Interesting color. Fixed aperture. Build to last. Apart from being related to the Vivitar Series I family, I believe this lens should have a different review thread, so there will be more information available on this great lens. This is my best manual Tele-zoom lens so far. I bought this, also it's 'shorter' brother the 28-85mm f/2.8-3.8, out of curiosity about "The Legendary Kiron" that I just have to see it myself. Indeed, it's all about seeing is believing The build quality is outstanding, this is the first thing that I see. I have a few sturdy Tamron Adaptall zooms, but this one is not to be considered inferior. With 62mm filter thread, this lens is heavier and bulkier (so it should be better build, IMO) than comparable Adaptall zooms. Oh yes, about the legend that say this lens is pretty sharp, it is. Period. ..or, why don't you get yourself a copy to really 'see' what I mean?